"Are you getting any glare from my trophy? Perhaps we should have posed with the Tex Tan Saddle instead." Texas A & M sophomore Katrina McLeod (left) and Aggies Head Coach Tana Rawson pose with the Copenhaver Trophy, awarded each year at IHSA Nationals to the rider who wins the individual beginner western division. Several winners also receive a Tex Tan Saddle, with the Aggies now bearing enough of them this decade to start a tack shop! Harrisburg, PA - Over the past six IHSA National shows (including 2006) a total of 33 individual stock seat classes have taken place. Five classes were held 2001-03, then the novice western horsemanship division was added for the 2003-04 season, resulting in a sixth class. Somewhat astoundingly, 19 of the 33 classes over these six seasons have been won by one of two schools. In reverse order, Fresno State, Saint Mary-of-the-Woods College, Black Hawk College and West Texas A & M have won one individual class each; Kansas State and Morrisville State have both come up a winner twice; Ohio State and Oklahoma State have won a total of three classes each; Texas A & M has won nine classes while Findlay has ten blue ribbons in individual western classes, nearly one for every three times the jog is requested. Entering 2006 Nationals the Findlay Oilers had a nine to six edge over Texas A & M in individual western blue ribbons, but the Aggies would at least temporarily draw even. The first individual western division started Texas A & M on their way, while the top four placings all went to riders from among the schools already mentioned as having won a blue ribbon this decade. This division was intermediate western horsemanship, and sixteen riders took part. When each individual class was pinned, the riders who finished out of the top ten were excused first (though each received a participation ribbon upon registering for their respective classes). Tenth place in individual intermediate western went to Mary Duffy of Cazenovia College, the first of four Wildcats to compete individually. Megan Boone of the University of Nebraska at Lincoln had given the Cornhuskers the early lead in the western team competition, having won the team novice western horsemanship class. However the freshman from Ashland, Nebraska was only ninth in this division two classes later. Eighth place went to Lea Waldbillig of the University of Maryland while seventh place went to Christine Geib of Kutztown University. Waldbillig earned the highest University of Maryland ribbon of the show while Geib gave the Golden Bears their best undergraduate ribbon (a seperate article detailing the four alumni classes is in the works - Editor). Middle Tennessee State had a rider in each of the first four individual western classes, and Michael Hunsinger was the first of four Blue Raiders to make the top ten, placing sixth. Janie Talbot was the first of two Western Washington riders to compete, placing fifth. Elsewhere on this site you may have read that Amanda Yancey of Oklahoma State 'ended her IHSA career' with a second in individual walk-trot. In reality the senior from Tulsa had another ride at Nationals still ahead of her, and in fact had the honor of competing in consecutive classes. Yancy had to change out of her english apparel, put on her western outfit and get in the ring in a very short time. Considering this quick-change act, Yancey still finished fourth in individual intermediate western (It is worth noting that the issue of having to ride in consective classes - one english and then one western, or vise versa - seems to affect Oklahoma State the most. Current New Mexico State western coach Kristen Thomas won the 2000 team advanced western division for Oklahoma State, then had to run and change into her english attire and get in the ring for team intermediate flat moments later). Third place went to Findlay freshman Callie Kooiker, one of seven oiler riders to compete individually over the course of five classes. Second went to Shane Mathis of Black Hawk College. A sophomore from New Berlin, Illinois, Mathis was making his second appearance at IHSA Nationals, having finished outside the top ten in individual beginner at the 2005 show. She told this writer she was from Portland, but the official Texas A & M site says she is from Lake Oswego, Oregon. 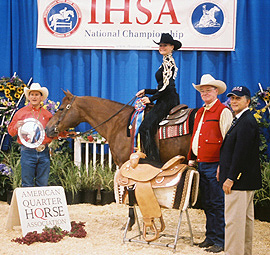 Regardless of where home is, Aggie junior Kate Toomey is the 2006 IHSA individual intermediate western champion. Toomey joined former AQHA Trophy winner Quincy Cahill and teammate Debbie Ramirez as the only Texas A & M riders to win multiple classes at IHSA Nationals. If you combine western team classes with individual classes, no program has faired better than Texas A & M this decade. 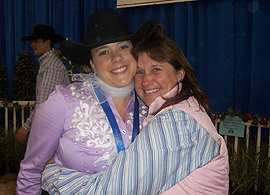 Kate Toomey of the Aggies won the team intermediate western division at 2005 Nationals, and this season the junior from Portland, Oregon won the individual intermediate. Toomey had finished out of the ribbons in team novice western horsemanship two classes earlier, but her performance here was superlative. On the official Texas A & M web site, Toomey is quoted as saying that she thought the individual class "was a toss-up" after having watched Mathis's round and that she "felt redeemed after what happened in (her) team class." Toomey became only the third Texas A & M rider with two firsts at IHSA Nationals. One of the other Aggie riders to accomplish this feat would add to her win total later on. Intermediate western was the only individual undergraduate western class on May 5th. Likewise open western horsemanship was the only individual undergraduate class on May 6th. Open western was one of two western classes to feature only 14 riders (no one from Zone 4 reached the 35 points necessary to qualify for Regionals) and nine of the 14 would ride again in the Reining Phase of the AQHA Trophy competition two classes later. Kutztown freshman Lauren Casale was one of the five riders making their one-and-only appearance at 2006 Nationals, starting off the placings with a tenth. Ninth place went to Nikki Klein of Middle Tennessee State, who would ride in five classes over the course of three days, earning her best ribbon with a sixth in the AQHA Trophy division. Kansas State junior Sara Weller was eighth, but the Garden City, Kansas resident would improve on this placing in the individual open reining. Wildcats earned back-to-back ribbons, but only because both Cazenovia and Kansas State have the same mascot! Meghan Dauler of the Cazenovia Wildcats earned a seventh while Ohio State senior Ashley Kovar was sixth. From Delta, Ohio, Kovar would also earn a seventh in the AQHA Cup later in the day. Fifth place went to Saint Mary-of-the-Woods junior Christina Ecker, who would place fourth in the AQHA Trophy while Lauren Brown of Berry College took fourth in this division. This was the only individual appearance for Brown, who was the only rider to compete for both the AQHA Trophy and the Cacchione Cup at 2006 Nationals. 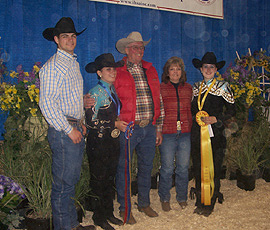 Third place went to Emily Cramer of Stanford, one of two western riders from the Cardinal to compete over the weekend. Erica White of Findlay took the reserve ribbon. From New Iberia, Louisiana, White was the only rider in the top seven that did not compete in the AQHA Trophy division two classes later. The junior would be the first of three Oiler riders to place second in an individual western class. Oklahoma State Head Coach Larry Sanchez (far left) holds the IHSA Perpetual Trophy awarded to the individual open western champion, which in 2006 was his own Brianne Wiebe. The junior from Acme, Alberta (on horse) is the first Canadian rider to win a class at IHSA Nationals since Lindsey Phibbs won the Cacchione Cup for Skidmore in 1999. Back in 1999 a rider by the name of Lindsey Phibbs won the Cacchione Cup. Phibbs was technically from the state of Ohio, but in fact was still a Canadian citizen, having been born in Ontario (The 2002 Skidmore graduate became a US citizen two years later). Oklahoma State junior Brianne Wiebe became the first Canadian citizen since Phibbs (or at least Canadian resident - Editor) to win an IHSA class at Nationals. From Acme, Alberta, Wiebe took home the top prize, becoming the first Cowgirl rider to win an individual class at Nationals since former teammate Lindsey Childress won individual advanced western at 2004 Nationals in Murfreesboro, Tennessee. Following the AQHA Trophy placings (including Wiebe placing third in the nation) and a good night's sleep, the final four individual classes took place on Sunday, May 7th, also the final day of the 2005-06 season. The morning opened with the advanced western horsemanship division, and for the second time Texas A & M would win while Findlay would place second. After six of the sixteen riders were excused Scott Vetter of the United States Military Academy would start the placings, earning tenth. Ninth place went to University of Minnesota - Twin Cities senior Matthew Saterbak, who was the first rider in team history to qualify for IHSA Nationals. This was also the only instance in which male stock seat riders placed back-to-back at 2006 Nationals. Lauren Vile of Delaware Valley College, who scored the only western team point for the Aggies at 2005 Nationals, earned eighth place while Shane Elben became the second of two Western Washington riders to make the top ten with a seventh. The University of Kentucky had done well in the hunter seat divisions. Now it was senior Jessica Harbours' turn to deliver in western. Harbour, who will return to the Wildcats in the fall, earned the green ribbon here. Samantha Riordan of New Mexico State was fifth, the junior from Albuquerque being one of three 'Aggies' to place in the top eight in the division (Delaware Valley, New Mexico State and Texas A & M are all known as the 'Aggies!'). Lori Puckett of Middle Tennessee State was fourth while Freshman LeAnn Roundy earned the best ribbon of the show for Utah State, finishing one place ahead of teammate Katie Rose, fourth in team beginner western a day earlier. The reserve ribbon went to Lauren Urbanowicz of Findlay. A junior from Browntown, Michigan, Urbanowicz was one of four Findlay riders to win their individual western class at Zone 6 Zones just over a month earlier. Judges Patti Carter and Carol Potter managed to 'worry' Texas A & M junior Christine Sceets. Sceets was quoted on the Texas A & M web site as saying she was "...a little worried when I wasn't called for additional testing but I was relieved when I figured out it was to help them place the middle of the class and not the top." Sceets felt strongly she was in the top three, and the Baytown, Texas resident was in fact the 2006 advanced western champion. At this point Texas A & M was only one blue ribbon behind Findlay for the most in individual western divisions since 2001. Would the next class even things out? The most anticipated individual class at IHSA Nationals each season is the individual open reining pattern. The National Reining Horse Association sponsors this division and provides an incentive: The top four riders in this division qualify to compete at "The Derby," the NRHA's own Collegiate Championship, in Oklahoma City on May 20th. The top four IHSA riders face four riders selected from the Varsity Championships and yet four more who get in via at-large bids pertaining to their prior NRHA work. Fourteen riders took to the ring one-by-one, with announcer Ken Marash giving scores following each pattern. These combined scores of judges Potter and Carter usually give away the placings. However two riders received a score of 145.5, which would be either fourth - or fifth place. When the placings were announced tenth went to Staci Banks of Washington College with a score of '136,' which was the same combined score that Jaclyn Ohman of Middle Tennessee State received but somehow Banks won the unknown tiebreaker. Ohman's teammate Klein faired better yet only duplicated her individual open rail placing. Klein earned a '136.5' from the judges while Ashley Dietz of New Mexico State appeared to end her season with a '139' and eight place. It was the final IHSA ride of the season for the freshman from Billings, Montana, but Dietz's work at the Varsity Championships combined with her efforts at IHSA Nationals made her one of the four at-large entries into the Derby. Alicia Wittwer of the University of Nebraska at Lincoln was seventh with a score of '141.5' while Keith Ceddia of Ohio State placed sixth with a score of '143.' Ceddia, whose older brother Ryan also rode for Ohio State, would enjoy the same fate as Dietz, as he too would be an at-large selection by the NRHA for the Derby. The question as to whom was fifth was resolved when Marash announced Kansas State's Weller as the recipient. This meant that not only had Amanda Kudrna-Potts of Rocky Mountain College earned the best ribbon of the show for the Grizzlies she had even become the first rider in program history to qualify for the Derby. Third went to Rachel Currat of Oklahoma State, who scored a '147.' From Edmund, Oklahoma, the Cowgirl junior was making her IHSA Nationals debut, which in turn would result in her Derby debut. Findlay junior Bryan Penquite was second to Ceddia at Zone 6 Zones but finished four places higher here. The Galloway, Ohio resident had scored a '147.5' but would have to face Ceddia one more time at the Derby. Jennifer Hoyt (right) coaches both the Syracuse and S.U.N.Y. - Cobleskill western teams. So why give a hug to Jamie Abel of Morrisville State College? Because Abel is her daughter, that's why! This hug came after Abel won the NRHA-sponsored individual open reining division. Abel thus qualified for the NRHA Derby in Oklahoma City on May 20th, at which time she won again. Since 2001 four of the five previous winners of the NRHA open reining had been members of the Findlay team. At 2004 Nationals Kyle Johnson of Morrisville State College snapped Findlays' three-year winning streak, though Jake Bowman had attempted to start a new streak for the Oilers last season. The pendulum swung back to Morrisville this time around, as senior Jamie Abel led the way with a '149' score. Abel had placed eighth in the individual AQHA Trophy and would place third in the final class of the day, team open western horsemanship, but nothing would top first place in the individual open reining. Incredibly, only four schools have ever won this division since it was created in 1993. Findlay riders have won it six times, Ohio State four times (but not since 1999), Texas A & M once (Quincy Cahill in 2000) and two of the last three for the Morrisville Mustangs. Abel, whose Mother Jennifer Hoyt coaches both the Syracuse and S.U.N.Y. - Cobleskill western teams (making her one of only two coaches this season to coach teams in SEPARATE Regions), thus extended her season to May 20th with the top four placing. And how did IHSA riders fair at the pretigous Derby? Kudrna-Potts finished 12th out of 12, while Whitney Kimble of Varsity-only Auburn was 11th. Tenth went to another Varsity rider in Rachel Sternoff of the University of South Carolina, though it should be noted that Sternoff was once an IHSA rider, finishing second to Katie Leonard of Berry College in the 2004 Zone 5, Region 2 Western Open Rider Standings by only two points. Though Wiebe was only fourth in open reining at Zone 7 Zones on April 9th she was an at-large selection, snaring ninth place. Dietz was eighth, though her score was identical to Penquite who earned seventh. Currat was sixth while Ashley Griffith of Varsity-only Auburn was fifth. The Auburn freshman learned a thing or two from Ohio State coaches Ollie and Debbie Griffith, who happen to be her parents! Fourth place in the Derby went to Lindsay Williams of South Carolina, the only at-large entry this year not to cross over into the IHSA. 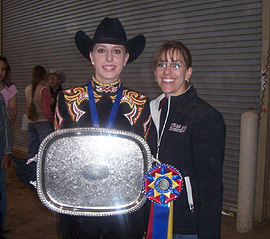 Tonna Brooks of Texas A & M rode in team open reining at 2006 IHSA Nationals, placing second, and had done well at the Varsity Championships. Brooks was third at the Derby while Ceddia (who is coached by the Griffiths during the IHSA season) finished ahead of Penquite this time around with the Reserve Championship. Bonnie Miller is the Head Coach at Morrisville State and even though her rider may have learned a thing or two from her Mother she can still claim the Derby winner. From Manlius, New York, Abel won the Derby aboard a horse named Berry Great Twist with a score of 218.5. Abel and Ceddia took part in a 'Runoff' to break a tie, as both had the same score initially. Backtracking to IHSA Nationals, the beginner western horsemanship division immediately followed the open reining, with sixteen riders competing. After everyone had walked, loped and completed their pattern it was time for the placings. Tenth place went to junior Shelly Dey of Missouri State University, a school known until this season as Southwest Missouri State University. Ninth place went to Mary Heffner of Rutgers, who went undefeated at both Western and English Regionals, and then dupicated the feat at Zone 3 Western and English Zones! Eighth went to Kimberly Church of Morrisville State. The Mustangs had a rider in every undergraduate western class at 2006 Nationals, and Church was not the first nor would be the last to place eighth. David Strecker of Miami of Ohio earned seventh while Courtney McGowan of Rocky Mountain College was sixth, improving on her individual walk-trot ride when she missed the top ten. As a sophomore, Kristin Farmer of Berry College had finished out of the ribbons in team beginner western at 2005 Nationals in Sunbury, Ohio. This was not the case in Harrisburg, as Farmer was fifth here. Gina Remus of Kansas State had placed sixth in that same 2005 team class, and was higher up with a fourth this time around. Ohio State junior Patti Rohrs had not been in that team class last season, and would be the only rider in the top five making her IHSA Nationals debut. Rohrs was third while Laryn Burns of Oklahoma State finished her IHSA career with a second. From Stillwater, Oklahoma, Burns improved by one placing on her team beginner western showing last season. The senior also placed fifth in 2005 in individual walk-trot. Like several others, Katrina McLeod of Texas A & M had ridden at 2005 Nationals in team beginner western (placing fourth). Like Burns, McLeod also crosses over to ride hunter seat (third at 2005 Nationals in team walk-trot and repeating the yellow ribbon in individual walk-trot this season). The sophomore from Rockport, Texas pulled Texas A & M even with Findlay since May of 2001 with a first in beginner western. Yet another quote on the Texas A & M web site (found at http://www.aggieathletics.com/pressRelease.php?PRID=11391 if you want the complete comments) indicated that McLeod tipped her hat in a way to Burns, Cowgirls Head Coach Larry Sanchez and the entire Oklahoma State Team. Texas A & M senior Debbie Ramirez would win the final team class of the show, giving the Aggies four blue ribbons at 2006 Nationals (Ramirez went undefeated over the course of three IHSA National shows). Texas A & M went varsity in the fall of 1999 (not 2000 as previously stated) and won nine individual western blue ribbons at IHSA Nationals from Fall of 2000 through May of 2006. Surprisingly, the Aggies had riders in only 17 of the 33 individual western classes in that span, but when they survived Zone 7 Zones they were able to win at Nationals better than half the time. Texas A & M and Oklahoma State have stated this is probably their final year competing within the IHSA, and if that proves to be true, the riders and coaches from both of these programs will be missed. Aggies Head Coach Tana Rawson and Cowgirls Head Coach Sanchez have made their programs so good throughout the decade that many expect the Western National Champion team to come from Zone 7. Though Kansas State is certainly trending upward (the Wildcats were once in the same region with the Aggies and the Cowgirls), the only other teams besides Texas A & M and Oklahoma State that are usually given much of a chance come from the state of Ohio, and with neither around in 2006-07 both Ohio State (the 2006 National Champion Stock Seat Team) and the University of Findlay (the 2005 Champion) will be heavy favorites to be top five teams in Springfield next May (provided they both survive Zone 6 Zones). The final individual class of 2005-06 was novice western horsemanship. This division marked the first time since May 5th of 2002 that an individual western class took place at IHSA Nationals without a single rider from either Texas A & M or Oklahoma State having qualified (Amber Everhart of Kansas State and Jeremy Johnson of Colorado State were the Zone 7 survivors in beginner western that May 2002 Sunday), ending a run of 22 straight classes with at least one of the two schools being represented. The novice division, now in it's third season, had been good to Findlay the first two. Dee Ann Whitehead had won in 2004. 2006 AQHA Trophy winner Travis Womer won it last season (with Oiler teammate Adam Smith finishing second). Findlay had two riders in the division this season. Could the Oilers make it three straight and move back ahead of Texas A & M? When the placings were announced it was Heather Reynolds earning the final Cazenovia ribbon of the season with a tenth. Seattle University senior Marika Dye took ninth place. Dye's final IHSA undergraduate ride was the first-ever Seattle University ride at an IHSA Nationals show. Morrisville earned another top ten placing as Ashley Kelkenberg was eighth. Carrie Antiel earned the final Rocky Mountain College ribbon of the season with a seventh. Rocky Mountain never had a rider at Nationals before this season yet Head Coach Chris Brown could claim three western riders and a full hunter seat team in Harrisburg this time around. Jennifer Miller was the lone Murray State rider at 2006 Nationals, the junior earning sixth place. They kicked up some dust! : From left to right are Coach Jake Bowman, individual novice western champ Jamie Elizondo, Coach Clark Bradley, Coach Cindy Morehead and third place finisher Sharon Tebbe. All either ride or coach for the University of Findlay, and thanks to Elizondo the oilers can claim at least one individual western blue ribbon at each of the past six IHSA National shows. 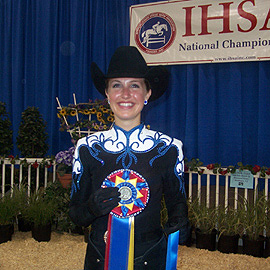 Allison Kralovansky was the lone Purdue western rider at 2006 Nationals. Though the Boilermakers are known for their english program taking a full team to Nationals 18 times in 19 seasons, Kralovansky did the western team proud, placing fifth. Clara Grundman was the third of three University of Nebraska at Lincoln riders to place inside the top ten, earning the highest individual ribbon of any Cornhusker with a fourth. Findlay's chances of taking another blue ribbon in novice looked pretty good at this point. Only senior Sharon Tebbe, freshman Jamie Elizondo and West Texas A & M junior Courtney Douglas remained in the ring. Marash announced Tebbe as the third place recipient, making it a 50/50 proposition for the Findlay unbeaten streak to stay intact. Moments later Marash announced Douglas as reserve. Earlier Oklahoma States' Wiebe had become the first Canadian rider this decade to win an individual class. Douglas became the first Canadian rider to earn a reserve ribbon at IHSA Nationals in that same span. And both are from the province of Alberta! The junior from Edmonton had won the division at Zone 6 Zones, finishing ahead of three Texas A & M competitors. Elizondo, a freshman from Chesterfield, Michigan had made it three in a row for Findlay, giving them their tenth individual western blue ribbon in six seasons. Had Elizondo or Tebbe not won the novice, 2006 Nationals would have been the first IHSA National show since 2000 where a Findlay rider had failed to win an undergraduate western class. Since 1989 Findlay can now claim at least one individual western champion fourteen of the past eighteen seasons. Individual intermediate western horsemanship: 1. Kate Toomey, Texas A & M University. 2. Shane Mathis, Black Hawk College. 3. Callie Kooiker, University of Findlay. 4. Amanda Yancey, Oklahoma State University. 5. Janie Talbot, Western Washington University. 6. Michael Hunsinger, Middle Tennessee State University. 7. Christine Geib, Kutztown University. 8. Lea Waldbillig, University of Maryland. 9. Megan Boone, University of Nebraska at Lincoln. 10. Mary Duffy, Cazenovia College. Individual open western horsemanship: 1. Brianne Wiebe, Oklahoma State University. 2. Erica White, University of Findlay. 3. Emily Cramer, Stanford University. 4. Lauren Brown, Berry College. 5. Christina Ecker, Saint Mary-of-the-Woods College. 6. Ashley Kovar, Ohio State University. 7. Meghan Dauler, Cazenovia College. 8. Sara Weller, Kansas State University. 9. Nikki Klein, Middle Tennessee State University. 10. Lauren Casale, Kutztown University. Individual advanced western horsemanship: 1. Christine Sceets, Texas A & M University. 2. Lauren Urbanowicz, University of Findlay. 3. LeAnn Roundy, Utah State University. 4. Lori Puckett, Middle Tennessee State University. 5. Samantha Riordan, New Mexico State University. 6. Jessica Harbour, University of Kentucky. 7. Shane Elben, Western Washington University. 8. Lauren Vile, Delaware Valley College. 9. Matthew Saterbak, University of Minnesota - Twin Cities. 10. Scott Vetter, United States Military Academy. National Reining Horse Association open reining pattern: 1. Jamie Abel, Morrisville State College. 2. Bryan Penquite, University of Findlay. 3. Rachel Currat, Oklahoma State University. 4. Amanda Kudrna - Potts, Rocky Mountain College. 5. Sara Weller, Kansas State University. 6. Keith Ceddia, Ohio State University. 7. Alicia Wittwer, University of Nebraska at Lincoln. 8. Ashley Dietz, New Mexico State University. 9. Nikki Klein, Middle Tennessee State University. 10. Staci Banks, Washington College. Individual beginner western horsemanship: 1. Katrina McLeod, Texas A & M University. 2. Laryn Burns, Oklahoma State University. 3. Patti Rohrs, Ohio State University. 4. Gina Remus, Kansas State University. 5. Kristin Farmer, Berry College. 6. Courtney McGowan, Rocky Mountain College. 7. David Strecker, Miami University of Ohio. 8. Kimberly Church, Morrisville State College. 9. Mary Heffner, Rutgers University. 10. Shelly Dey, Missouri State University. Individual novice western horsemanship: 1. Jamie Elizondo, University of Findlay. 2. Courtney Douglas, West Texas A & M University. 3. Sharon Tebbe, University of Findlay. 4. Clara Grundman, University of Nebraska at Lincoln. 5. Allison Kralovansky, Purdue University. 6. Jennifer Miller, Murray State University. 7. Carrie Antiel, Rocky Mountain College. 8. Ashley Kelkenberg, Morrisville State College. 9. Marika Dye, Seattle University. 10. Heather Reynolds, Cazenovia College.